Big Head String Pickup NEW! Designed to be easily and quickly mounted so you can amplify your violin, guitar, upright bass, viola, mandolin, banjo, cello, cigar box, windowpane, motor vehicle... Whatever! Large, specially-selected 35mm brass piezo element provides rich, loud, clear tone that requires no preamp. Made with 12 inches of lightweight, super high-quality shielded Denko audio cable and a high-quality all-metal 1/4" female output jack. The element is coated in non-toxic black rubber to protect your instrument. Attach this pickup to your bridge or soundboard quickly and easily with the included removeable and reusable adhesive mounting tab or a small ball of softened beeswax. Secure the output jack to the f-hole, tailpiece or strap button of your instrument with the included nylon jack clamp and plastic zipties. Simple yet effective! The reinforced cable/head joint construction makes it both durable and moisture resistant. 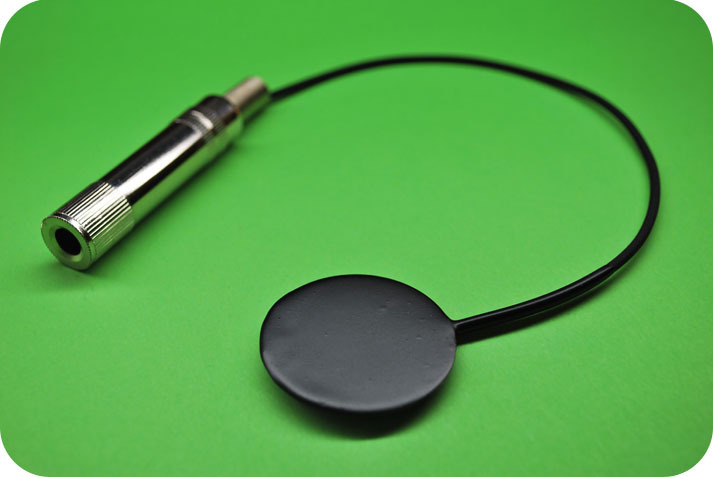 Believe it or not, it can even be used as a simple hydrophone! This item ships worldwide for FREE!